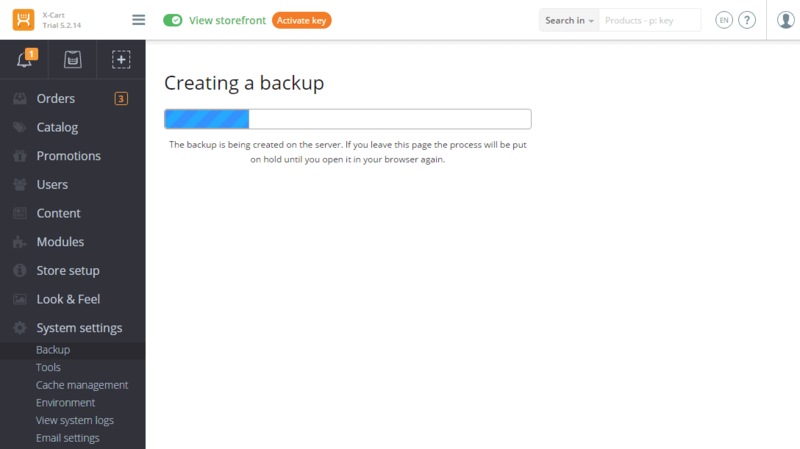 With this module you can create full backups of your online shop. Later, in case of any server or software issues with the website, you can restore your shop to a working condition from these backup files. The module creates a dump of your website database and includes it into the backup file. The module creates an archive file with core X-Cart 5 files, files of installed modules and files from the "images", "files" and "public" directories. Files from other directories are not included into the backup. Before creating the archive it checks the available space on the disk in order to prevent the website from being crashed due to a lack of free disk space. The module compress the backup file into a Zip archive file (requires ZipArchive extension). If there is no ZipArchive extension enabled in your PHP configuration, the module will try to fall back to other compression methods (Tar, Tgz, Tbz). The module splits the process into multiple steps to avoid issues caused by limits set on the number of open files, the memory limit, time outs, etc. Pros: It's convenient and automatic. It makes sure you backup before every upgrade. Cons: There's no way to restore the store from a previous backup without getting tech support involved. I recently installed two new modules. One of them (Google Optimize) disabled all the product links on the category pages. I wanted to restore the store from the previous backup, but there's no way to do it within the functionality of Backup Master. Luckily, when I disabled Google Optimize, the store worked again. I had assumed that Backup Master would have a "restore from previous backup" option. It does not. I would rate this a 3, not a 5. This review page won't let me select 3. I run this before every upgrade, it makes backing up a snap. Recommend!